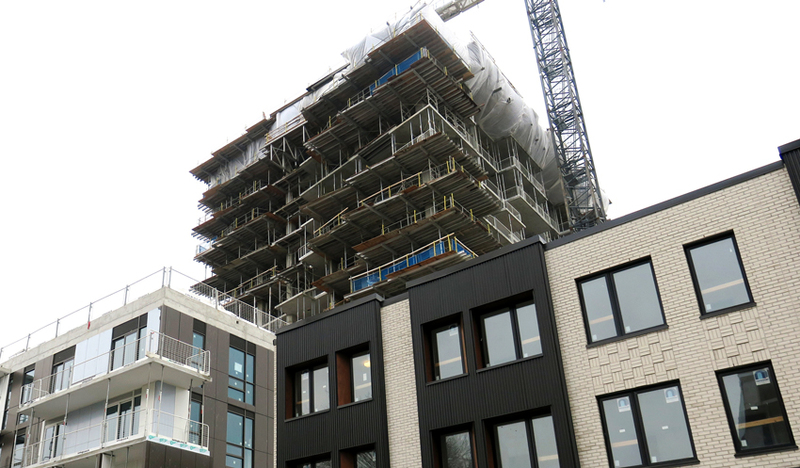 While polar vortexes and record snowfalls have made for an ‘exciting’ winter in Toronto, construction at the SQ2 community continues to push forward. Located in downtown Toronto, near Spadina and Queen, SQ2 “topped off” at its full height of 14 storeys and 169 suites earlier this month. Since that time, work has been progressing well. The on-site construction team are currently framing the suites on the 2nd and 3rd floors. One of the differences between framing in low and high rise construction projects is the use of metal studs. Metal studs are preferred in high rise for several reasons. First, they are less susceptible to weather. Second, they save space. Metal studs can be smaller than wooden studs but still have the same strength. As the interior walls are installed, electrical and mechanical rough-ins are are also being completed. What that means, is that once the framing for a bedroom is completed, the electricians install the electrical boxes which will eventually hold the electrical outlets. Up on the 4th floor, the exterior suite walls are now being insulated and vapour barriers are being installed. 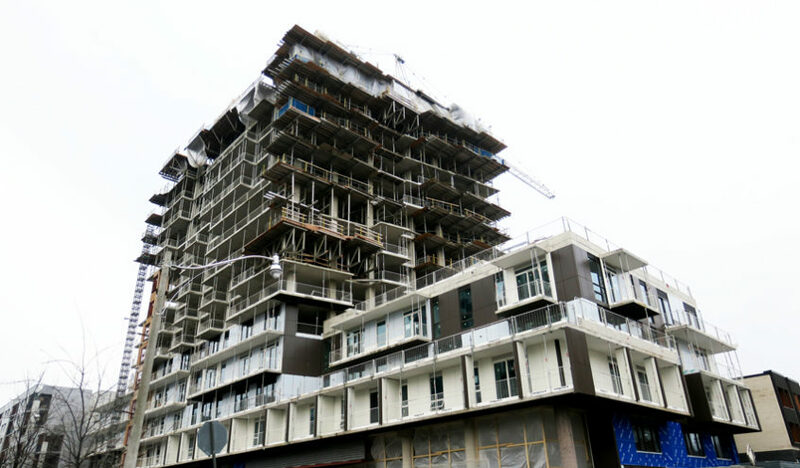 As part of the Tridel Built Green program, our condominiums utilize an environmentally-friendly insulation choice. On the 5th floor of the SQ2 community, the wall framing for the corridors is being installed. Windows have been installed up to the 7th floor and the on-site construction teams are now working on the 8th floor. While construction on the interior of SQ2 is ongoing, work around the overall community is also progressing well. In the underground parking levels, garage painting is 90% complete. On the other end of the building, the high roof, which is the elevator machine room, of SQ2 is complete. Block work in the mechanical penthouse room is expected to commence shortly. The mechanical penthouse is the room which will house the mechanical systems – such as the boiler and HVAC systems – which will serve the entire community. Block work consists of acoustical work to reduce the noise level produced in the mechanical room. Learn more about SQ2 at Alexandra Park.